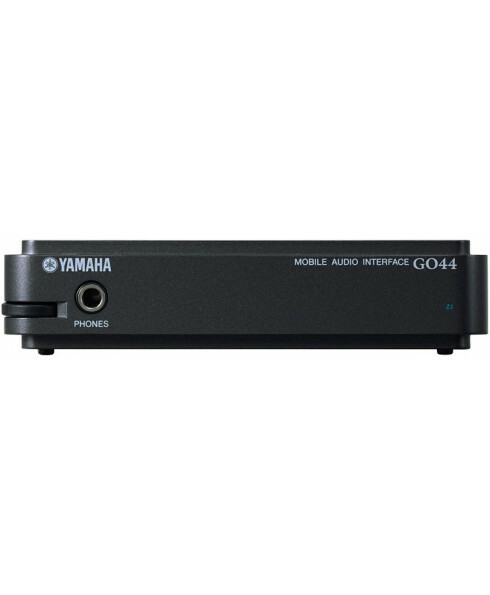 The Yamaha GO44 is a mobile audio solution that features high quality line inputs/outputs and worldclass MIDI and audio recording software enabling professional quality recording to a computer in a very compact package that can be carried and used virtually anyway. The GO44 was designed from the outset to be portable. The body is made from diecast aluminum, which is light yet exceptionally rugged. Recording can be done virtually anywhere - all you need is a laptop computer and the GO44. The GO44 boasts up to 24-bit/192kHz* resolution on the analog inputs/outputs - the best in its class - and 24-bit/96kHz on the digital I/O. This pro-level quality makes the GO44 perfect for any type of recording, and allows you to capture the full details and nuances of the original source - from the breathiness of a vocal to the delicate finger slides of an acoustic guitar performance. * Simultaneous playback of audio and input/output of MIDI is not possible when recording at 24bit/192kHz. The GO44 features 4-in/4-out multi-channel audio, with two analog phone jack terminals for both input and output, and special S/P DIF coaxial terminals for two-channel digital in/out. This device is simple and easy to use, yet provides high-quality recording capability - perfect not only for those who want to create music, but also for those who want an audio playback system for their computer that delivers outstanding sound quality. When the GO44 is connected to a computer equipped with a 6-pin FireWire™ (IEEE1394) terminal, power can be supplied from the computer without having to use the AC adaptor. This lets you record anywhere you want on your laptop's battery power, and actively use the device in places having few, or even no electrical outlets. Included with the device is an ASIO driver for near-zero audio delay (latency). This makes for efficient recording and mixing, by letting you apply VST plug-in effects and play your VST instruments with a MIDI keyboard in real time. Bundled Software Lets You Get Started Recording Right "Out Of The Box"
In addition to Steinberg's Cubase LE audio/MIDI sequencer, the GO44 package includes the VST plug-in instruments Groove Agent SE, which generates drum patterns, and HALion SE, a virtual sampler that can be played via MIDI keyboard. With your computer, all you need for complete MIDI and audio recording to hard disk is right in this box. This is a full-featured yet exceptionally easy-to-use professional music/sound production system, with up to 48 tracks of audio and MIDI, compatible with VST, and featuring a host of preset effects - all in one compact package. The digital outputs on the GO44 are compatible with the AC-3 and DTS surround sound formats. Simply connect a surround compatible amplifier/speaker setup, and enjoy the powerful sonic experience of surround sound.